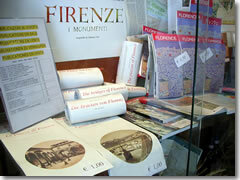 Everything is for sale at the Florence tourist office. The main tourist office of Florence is two blocks north of the Duomo on busy Via Cavour. There's also finally (as of 2011) a city-run infopoint right next to the Duomo where busy Via de' Calzioli leaves Piazza San Giovanni inside the cute little Renaissance portico of the Bigallo palace. However, the first office you'll likely encounter is the tourist office in the train station, which does a roaring business in booking you into local hotels for a modest fee—and, grumpily, handing out free maps of the city to tourists who don't need to book a hotel. 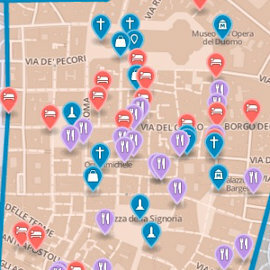 Use this map to find (a) your hotel, and then (b) the main tourist office on Via Cavour, where you can get far more useful intel on Florence. Evilly, they charge for much of their information now, but they do have loads of free pamphlets and events information. The Florentine launched in 2005 as an English-language magazine that comes out twice a month. Aimed at ex-pats, but packed with good info. It also has a website: www.theflorentine.netThey also stock a series of extremely useful pages listing, in table-like format, the current and up-to-date contact info, admission fees, and open hours for just about every sight in town. The only problem is you have to ask for these lists specifically, as they're not out on a counter but rather kept in binders. I keep pointing out to them how annoying and dumb this is (well, I don't actually call it "dumb"), since it keeps terribly useful and germane info away from the hands of the tourists who, ostensibly, the office exists to help and then wastes both their time and mine in asking for it, but to no avail. There is a small sheaf of these lists, each on a separate, two-sided piece of paper, and covering variously: musei statali (state museums), places that are open Mondays (handy), and other useful sightseeing info. Just ask for the "list of open hours and ticket prices for all the museums" (and, if you're interested, those other specialty ones).